“Tiller was no stranger”: Robin Abcarian and Nicholas Riccardi, “Abortion doctor George Tiller is killed; suspect in custody,” Los Angeles Times, June 1, 2009. “Scott Roeder had been”: Ed Pilkington, “For years anti-abortionists tried to stop Doctor Tiller. Finally a bullet did,” The Guardian, June 1, 2009. “The belief system”: Leonard Zeskind, “Racism, Anti-Semitism and the Murder of Dr. Tiller,” Huffington Post, June 2, 2009. “Roeder became”: Judy L. Thomas, “Suspect in Tiller’s death supported killing abortion providers, friends say,” Kansas City Star, May 31, 2009. “Roeder’s interest in Shannon”: Judy L. Thomas, “Suspect in George Tiller shooting is linked to anti-government group,” Kansas City Star, June 1, 2009. “Scott Roeder sat in”: Laura Bauer and Judy L. Thomas, “Operation Rescue adviser helped Tiller suspect track doctor’s court dates,” Kansas City Star, June 3, 2009. “Tiller’s death”: The Rachel Maddow Show, MSNBC, June 3, 2009. Transcript at http://www.msnbc.msn.com/id/31103875/ns/msnbc_tv-rachel_maddow_show/. “In an interview”: Amy Goodman, “Abortion Clinic Manager Reveals He Warned FBI of Suspect in Murder of Dr. George Tiller, Says Killing Could Have Been Avoided,” Democracy Now!, June 3, 2009. “As Daphne Eviatar”: Daphne Eviatar, “Little-enforced law opens window for suits against extremist groups,” Colorado Independent, June 3, 2009. “In 2006″: The O’Reilly Factor, Fox News Channel, November 6, 2006. Transcript at http://www.foxnews.com/story/0,2933,227658,00.html. Video at http://www.youtube.com/watch?v=hYulgba5BPE. “A few days later”: The O’Reilly Factor, Fox News Channel, November 10, 2006. Transcript at http://www.foxnews.com/story/0,2933,228628,00.html. “In February”: The O’Reilly Factor, Fox News Channel, “’The Factor’ Comes Face-to-Face With Kansas Abortion Doctor, George Tiller,” June 13, 2007. Transcript at http://www.foxnews.com/story/0,2933,281861,00.html. “Where was O’Reilly”: Operation Rescue, “Video: O’Reilly Confronts ‘Tiller the Baby Killer’ In Wichita,” OperationRescue.org, June 13, 2007. “In one instance”: Media Matters, “O’Reilly 2006 anti-Tiller rant: ‘[I]f I could get my hands on Tiller — well, you know. Can’t be vigilantes. Can’t do that. It’s just a figure of speech’,” MediaMatters.org, June 1, 2009. “Just as immediate”: John Amato, “Bill O’Reilly says he knew the left would blame him; uses biased panel to smear Dr. Tiller,” CrooksandLiars.com, June 1, 2009. “The next night”: Media Matters, “O’Reilly falsely claimed he only ‘reported what groups’ were calling Tiller,” MediaMatters.org, June 2, 2009. “But PolitiFact”: PolitiFact, “Bill O’Reilly called George Tiller ‘a baby killer’ without attribution,” PolitiFact.com, June 5, 2009. “Salon.com’s managing editor”: Hardball With Chris Matthews, MSNBC, June 10, 2009. Transcript at http://www.msnbc.msn.com/id/31249295/. “O’Reilly began”: David Neiwert, “’Talk about blood on your hands’: Walsh smacks O’Reilly with Jim David Adkisson — and shuts him up,” CrooksandLiars.com, June 13, 2009. “The next night”: Nicole Belle, “Bill O’Reilly Selectively Edits Joan Walsh Interview,” CrooksandLiars.com, June 16, 2009. “Meanwhile, Scott Roeder”: Roxana Hegeman, “Scott Roeder, Abortion Doctor Murder Suspect, Warns Of More Violence,” Huffington Post, June 7, 2009. “In 2001″: David G. Savage and Greg Miller, “Defining Terrorism Stirs Words of Dispute,” Los Angeles Times, October 1, 2001, accessed online at http://www.peacenowar.net/Oct%201%2001–LAT.htm. “The blind spot”: David Neiwert, “Sarah Palin, like most right-wingers, doesn’t get it: Abortion-clinic violence is terrorism,” CrooksandLiars.com, June 1, 2009. “One of the most significant”: CNN, “Threats against judges mushrooming, marshals say,” CNN.com, May 29, 2009. “In 2009″: Jerry Markon, “Threats to Judges, Prosecutors Soaring,” Washington Post, May 25, 2009. “The gun-show crowd”: Max Blumenthal, “Pro-Guns, Anti-Obama,” The Daily Beast, April 29, 2009. “Whatever agitation”: Eve Conant, “Rebranding Hate in the Age of Obama,” Newsweek, April 25, 2009. “When the Department”: “Rightwing Extremism: Current Economic and Political Climate Fueling Resurgence in Radicalization and Recruitment,” Department of Homeland Security, Office of Intelligence and Analysis Assessment, April 7, 2009. “The lone-wolf concept”: Louis Beam, “Leaderless Resistance,” The Seditionist, No. 12, February 1992; accessed online at http://www.resist.com/Articles/literature/LeaderlessResistanceByLouisBeam.htm . See also Jessica Stern, “The Protean Enemy,” Foreign Affairs, July/August 2003. “A white supremacist”: Anti-Defamation League, “Alex Curtis,” ADL.org, July 29, 2002. “The strategy”: Charles Montaldo, “Profile of Serial Killer Joseph Paul Franklin,” About.com. “Stephen Tyrone Johns”: Michael E. Ruane, Paul Duggan and Clarence Williams, “At a Monument of Sorrow, A Burst of Deadly Violence,” Washington Post, June 11, 2009. “It was not the first time”: Darryl Fears and Marc Fisher, “A Suspect’s Long History of Hate, and Signs of Strain,” Washington Post, June 11, 2009. “Here’s how Von Brunn”: Transcript of screen shot from von Brunn’s now-defunct website at David Neiwert, “What motivated an 89-year-old to shoot up the Holocaust Museum? White-supremacist hate and fear,” Crooksandliars.com, June 10, 2009. “After the shooting”: Anti-Defamation League, “James Von Brunn: An ADL Backgrounder,” ADL.org, June 11, 2009. “You can get the flavor”: Transcript of screen shot from von Brunn’s now-defunct website at David Neiwert, “What motivated an 89-year-old to shoot up the Holocaust Museum? White-supremacist hate and fear,” Crooksandliars.com, June 10, 2009. “Perhaps most telling”: Brian Montopoli, “Von Brunn: ‘Obama Was Created by Jews’,” CBSNews.com, June 11, 2009. “And yet, within mere hours”: David Neiwert, “Glenn Beck and his fellow wingnuts proclaim Holocaust Museum shooter not a right-winger,” CrooksandLiars.com, June 10, 2009. “On his radio program”: Media Matters, “Limbaugh on Holocaust museum shooter: ‘This guy is a leftist if anything’,” MediaMatters.org, June 11, 2009. “On his June 12 show”: David Neiwert, “Beck and Goldberg team up to claim that James von Brunn was a left-winger,” CrooksandLiars.com, June 13, 2009. “Goldberg explained”: Jonah Goldberg, “A Silly Game of Connect-the-Dots,” National Review, June 12, 2009. “Goldberg, in arguing thus”: Jonah Goldberg, Liberal Fascism: The Secret History of the American Left from Mussolini to the Politics of Meaning (New York: Doubleday, 2007), p. 7. “When we attempted”: Jonah Goldberg, “Neiwert, Again,” Liberal Fascism: The Blog, January 22, 2008. “something Goldberg also managed”: See Goldberg, Liberal Fascism, pp. 259-260. “Beck, on an earlier show”: David Neiwert, “Glenn Beck and his fellow wingnuts proclaim Holocaust Museum shooter not a right-winger,” CrooksandLiars.com, June 10, 2009. “As Stephen Budiansky explains”: Stephen Budiansky, The Bloody Shirt: Terror After the Civil War (New York: Plume, 2008), pp. 1-8. The portion cited here was excerpted in the New York Times. 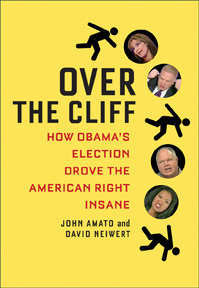 ‘Over the Cliff’ is Open for Business! Open Thread - Product Placement FTW!